Shipping to U.S. & Canada Only. The Ultimate memory size - 1 Megabyte is the largest memory space that can be recognized, read and used by Brother, Babylock, Bernina Deco or Simplicity sewing machines. Store about 35-40 patterns with over 450,000 total number of stitches. At the same time, this card provides the maximum storage capacity of 512k (about 230,000 stitches) for Viking, Husqvarna machines. The Ultimate compatibility - Use the same Ultimate Card with Brother, Babylock, Bernina Deco, Simplicity and Viking, Husqvarna embroidery machines. Each brand requires a diffirent programing method that is provided by The Ultimate box or other embroidery reader/writer devices. The Ultimate adaptability - The Ultimate Card, Ver I works with The Ultimate Box, The Magic Box, Amazing Box or Bernina box. Note! For use with PE-Design Box, Ver. 4.0 (Palette, Deco Wizard) you need The Ultimate Card, Ver. II (can also be programmed by The Ultimate Box). The Ultimate Card can be used with the following embroidery machines. 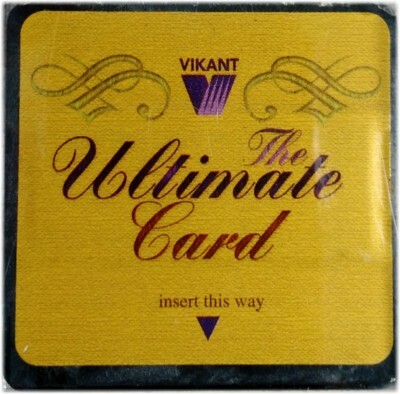 For more information on The Ultimate Card click click here. Each card comes with a 30-day Money Back Guarantee! Hi, Vanessa. Thanks for the inquiry. We'd recommend the Ultimate Box Basic or Plus for you with a Type I Ultimate Card. If you're wanting to size letters or other designs, I'd recommend the Ultimate Box Plus. Otherwise, the Ultimate Box Basic will be sufficent. I have a Viking Scandinavian 300 embroidary machine and am in need of the embroidary booklet as well as any additional embroidary cards for this machine. Do you know where I can get these and/or there other embroidary cards that may be compatible with this machine that I may be able to use instead? Thank you. Hi, Martha. Thanks for contacting Embroidery.com. If you require pre-loaded cards, instead, you can type "Viking Scandinavia 300 embroidery cards" into your favorite search engine, such as Google, to get some options. how long to shipping take? Hi, Jodie. Most items ship out within 24 business hours. Shipping time varies depending on your shipping method and location. As you are an international customer, your standard shipping method will be USPS First Class Mail International, which normally takes approximately 7-12 days (but can take up to 21 days, depending on factors such as customs). You will have other shipping methods available at checkout if you need your package faster. P.S. In some cases, items are out of stock. If that is the case, you will be notified at checkout that the item is out of stock and how much longer it would take to arrive. I have a Embroidery Professional Babylock Model EMP6 and I would like to have a user manual for this machine. Would you know where I could download one or purchase one. Hi, Sharon. Embroidery.com is not able to provide user manuals and I can't seem to find one elsewhere online. If I were you, I'd probably keep an eye on Ebay to see if one pops up for sale there.